Summer is well underway here in Florida! The heat is on, and it has definitely changed my view on cooking! I haven't been sticking to my menus as religiously as I normally do, and the hubs has taken notice. He used to check the blog to see what was for dinner, but lately he feels it is all a farce! Poor guy. I am going to try to do better this week. 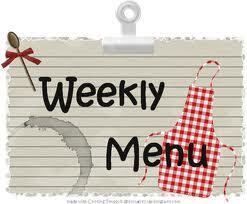 The menu is really shaping up to be great this week, so it shouldn't be too hard to stick with it - even in the heat. Roast Beef is on sale this week and these sandwiches are easy to make and really yummy. You'll need 1lb rare roast beef, 1 can french onion soup, 4 onion kaiser rolls, 4 slices swiss, provolone, or whatever cheese you prefer. Heat the french onion soup in a sauce pan with 1/2 a can of water. Add the roast beef and heat through. Meanwhile toast the rolls in the oven. When toasted top with roast beef and a spoonful of the soup. Add cheese on top of the meat and melt in the oven. Serve with extra juice and french fries. NOTE: I should have known $9.99/lb was too good to be true for the Ahi Tuna! I got to the fish counter and saw it is actually $9.99/each! This is still a decent price, but I decided to use the frozen Tuna I picked up for $6.99 - bag of 2 steaks. I figure with the delicious glaze this is still going to be yummy, and I can keep it cost effective as well.